Vacillation was formed sometime in 2006 by current members Josh Ellis (vocals) and Adrian Socaciu (guitars), but did not become a full functioning band until early 2008 with the addition of Nick Cooper (bass) and Michael Lucio (drums). 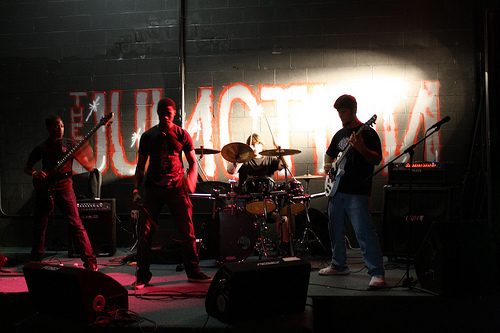 After playing many local shows with this current lineup, in addition to the release of the 2008 demo, former drummer Michael Lucio quit and was replaced with the current drummer Garret Healy. The band recorded the EP "Sadistic Nature of Mankind" in the beginning of 2010 with producer Allan Davis, which features 4 brand new tracks and is currently released independently. Our music is deeply rooted in Swedish melodic death metal along with many other influences spanning the entire metal spectrum. The main influences that have driven this band have changed dramatically over the years but lets just say that the band's current work is heavily influenced by Naglfar, Decrepit Birth, Kalmah, and Amon Amarth. We strive to release our best material, most standard melodic death metal bands I feel are straying away from the true meaning of the genre. If you're looking for blast beats, searing leads and melodies combined with true death metal vocals, this is the band for you. We have released an EP only recently and have not gotten very much promotion due to it being an independent release, hopefully that will change in the near future. We have played live a few times this year, however we have been inactive as of late. Most of the members are involved with other bands/projects or studying at a University so the frequency of rehearsing and playing live has diminished. I believe a large audience would enjoy our music, it isn't the most brutal or the most technical, but it has plenty of melody mixed with brutality. There aren't very many bands of this genre in Houston or Texas for that matter although there are plenty of fans that would be interested in our music. Hopefully a full length is underway in the near future and possibly a few more shows here and there. If you want to purchase our demo, send a message to either page.